While it lends itself naturally to a flat surface, poured resin can easily be used on sloping surfaces and ramps, so there are no raised thresholds to negotiate when moving between different levels. It can also be used in outdoor spaces including multi-storey car parks – ensuring that your passengers’ luggage has a smooth surface to roll over from the moment they leave their car to the moment they reach the check-in desk. This of course has other benefits too, for example if passengers have wheeled hand luggage they keep with them right through to the boarding gate, and for wheelchair users and the airport’s own courtesy vehicles. • Cover large areas with a seamless finish and fast, clean installation. • Embedded graphics and lettering or epoxy paints added to the surface later offer demarcation options. • Highly durable resin surface will not wear out easily over time. • Options to add drainage with a slight run-off slope or texture for extra grip on rainy days. Whether you already have an existing floor that is past its best, or you are building a brand new terminal and need suitable industrial flooring to cover a very large open area, Thelwell Flooring can help. Our expert team have worked on many very large premises including all kinds of transport terminals and interchanges, and multi-storey car parks as well – complex installations with many different elements to keep in mind. We can advise on the best type of resin finish, complete with suitable primer layers, floor preparation and top surface graphics and textures. 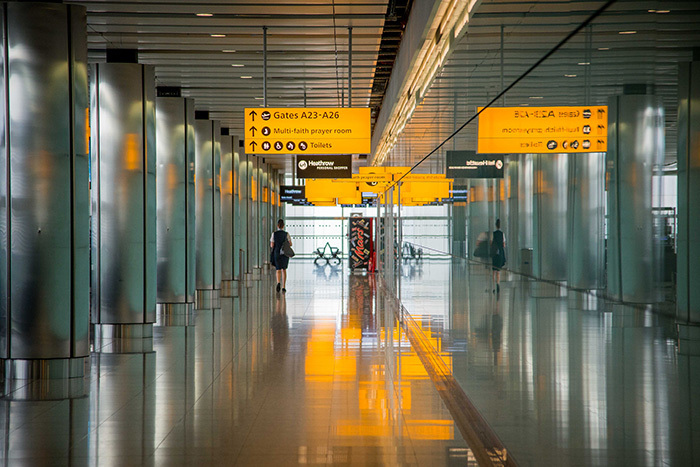 Our work is carried out quickly and professionally, to the highest of standards, using equipment that ensures the resin is level and dries fast, so your airport terminal can begin accepting passengers again as soon as possible.